GIGABYTE Server, the B2B arm of GIGABYTE's enterprise line, is adding the G190-G30 to its roster. 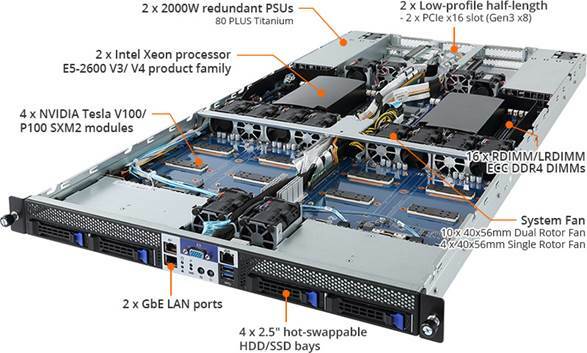 This is a 1U server that uses four SXM2 GPUs and dual Xeon CPUs. This GPU form factor is designed for embedded on-board connectivity, similar to NVIDIA's DGX-1 server line. The G190-G30 is designed to accommodate four NVIDIA Tesla V100 or P100 GPU accelerators, using NVLink for higher bandwidth and improved scalability over PCIe for the GPU to GPU interconnects. This design is said to allow increased flexibility and performance throughout the lineup. 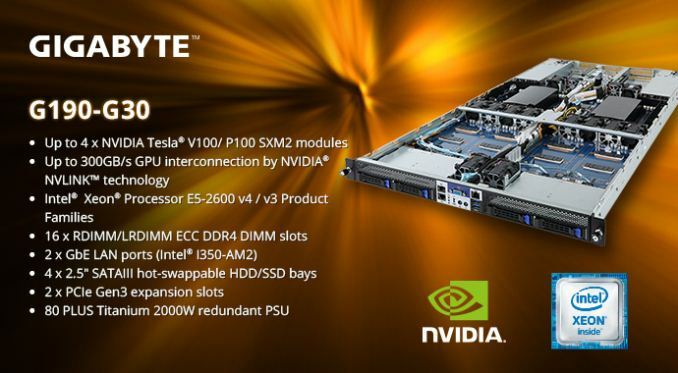 Using the NVIDIA Tesla V100 in the G190-G30, the system is able to support up to six NVLink links, each with a signaling rate of 25 GB/s in each direction, for a total bandwidth of 300 GB/s or 10x the bandwidth of PCIe. The higher bandwidth and reduced latency of the cards should allow servers that use them to remove interconnectivity bottlenecks and achieve better performance in intensive cross-communicative computing applications. 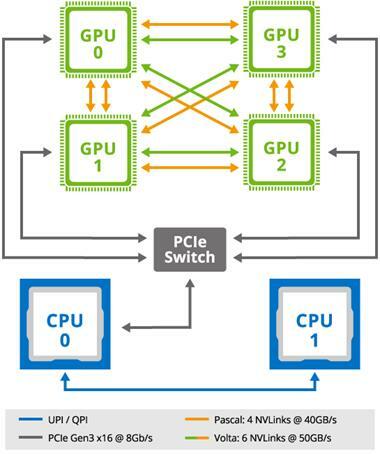 The P100 Pascal based GPUs use four NVLinks at 20 GB/s in each direction. Internally, the H190-G30 supports dual Intel Xeon Processors in the E5-2600 v4/v3 product families (Broadwell and Haswell). This means up to dual 22 core processors. Each CPU has a total of eight RDIMM/LRDIMM ECC DDR4 DIMM slots in quad channel, supporting up to 1TB when fully populated with 64GB DIMMs and v4 CPUs. The server also uses dual Intel I350-AM2 GbE LAN ports, four 2.5-inch SATA3 hot-swappable HDD/SSD bays and has two low-profile half-length PCIe 3.0 x16 slots (at 3.0 x8). GIGABYTE’s optimized airflow comes from 10 40x56mm dual rotor fans and four 40x56mm single rotor fans. Powering the entire server are dual 2000W redundant PSUs sporting an 80 Plus Titanium rating. 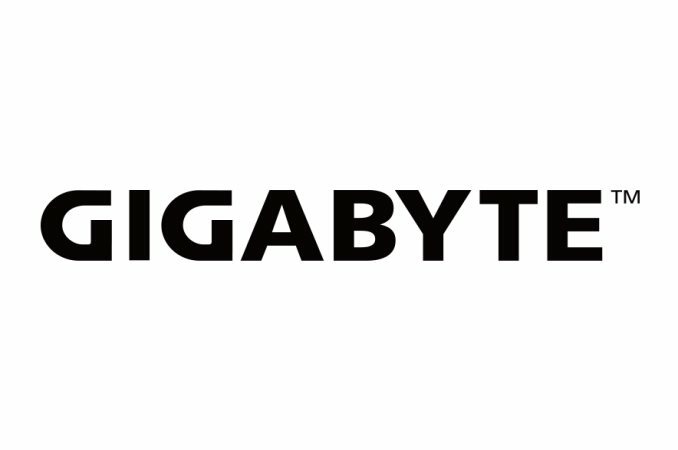 Interested customers will need to get in contact with their local GIGABYTE Server representatives for more information. Sizing UP Servers: Intel's Skylake-SP Xeon versus AMD's EPYC 7000 - The Sever CPU Battle of the Decade?